Hi friends! How has your week been? Mine was good. It’s actually my birthday today (I can’t believe I am 30 today – that sounds so old!). I have to admit that I am a little stressed about turning 30. A little mid-life crisis happening over here at the moment. There are just certain things that I imagined would be very different at this point in my life. Lately I have become very aware of all the sacrifices I have had to make over the years for medicine, mainly in my personal life, and I really have a lot of regrets when it comes to this. I honestly don’t think all the time I have had to spend away from my relationships, and all the events I have had to miss has been worth it. It seems like my twenties have been a blur of living in the hospital, doing homework, lacking sleep and missing out on a lot of fun and important things with my friends and family. Things and memories that I will never be able to get back. No career in the world is worth that if you ask me. But, I don’t want to bore you with all of my personal stressors at the moment, and in trying to keep a positive attitude I was busy celebrating over the weekend. I had dinner with some of my closest friends on Friday night at one of my favourite restaurants, Open Range. I had a duck dish that was super tasty and then a trio of sorbet for dessert. Have you noticed that duck is always amazing at restaurants? Whenever I see duck on a menu I always order it. Just a little advice from me to you. Then on Saturday my sister and I went to a dance show called Shaping Sound. It was so good! And the music in it was amazing. Do you watch So You Think You Can Dance? Once of my favourites, Travil Wall from the show was in it. The show is currently touring North America and if you have the opportunity to go I would highly recommend it. Definitely a good night of entertainment. Finally, on Sunday my mother, sister and I went to the Vance Joy concert. One word: amazing! He was so good live! If you don’t know his music you must go and listen right now! Seriously right now! Oh and of course I went to spin class on Sunday. Part of my regular weekend routine these days (when I’m not working of course). All in all it was a pretty darn good weekend! But moving right along to this weeks post. I realize it’s been a couple weeks since I posted a recipe for you guys. Shame on me right? To think I call myself a food blogger! I just had so many other things to share. But it’s back to food as usual today my friends. 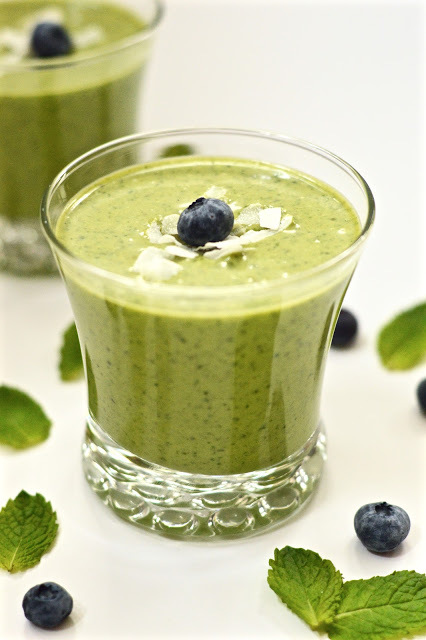 And in case you are still detoxing from all those holiday treats I have the perfect recipe for you today: a Peppermint Smoothie. 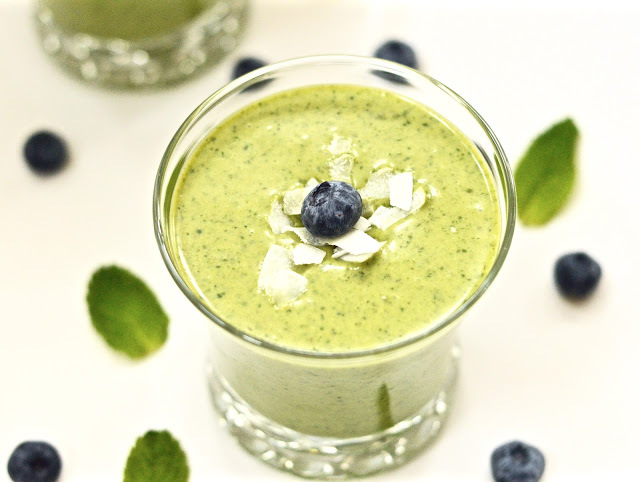 Not only is this one super simple to make, but it is filled with nourishing ingredients like spinach, mint leaves, bananas and coconut. Nothing complicated here folks. 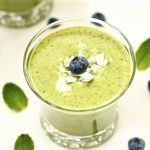 This one contains only five ingredients, is ready in less than five minutes, and is safe for many diets including a vegan diet, the paleo diet, AIP diet, GAPS diet and SCD diet. I would love to hear what you think of this one!